$3.50 Real Tattoos this weekend... I'm not kidding! 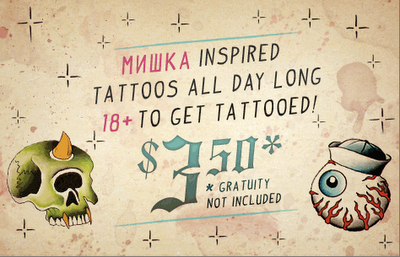 In honor of their 1st Anniversary, retail store Mishka is teaming up with Three Kings Tattoo to offer tattoos for $3.50! How crazy is that?! The catch is the tattoo has to be one of Mishka's signature designs... Now while I'm all for accumulating tattoos, skulls and eyeballs aren't really my scene, but some of my friends might enjoy this! I don't know .... after this last one I got I don't know if I can do it again... but then again 3.50 there has to be SOMETHING I want that is small and not painful!